Vet admission to assess patient pre-operatively, as well as discuss details of procedure and estimate with the owner. Pre-anaesthetic bloods (recommended for all patients older than 8 years, or if there is a clinical indication in those younger). IV fluids (if indicated based on blood results and /or vital stats whilst under general anaesthesia). Premedication and pre-emptive analgesia followed by induction of general anaesthesia. Dental charting of teeth and mouth. Extraction of excessively mobile teeth. Discharge with vet for discussion of findings (gross and radiographic), as well as future recommendations. Scheduling of Stage II (if required) 1-2 weeks later, including production of estimate by vet. Home with additional pain relief and/or antibiotics (if indicated). Note: 10% off for PHC members. Nurse post-op check after 3 days. Second procedure performed 1-2 weeks after the first, to complete surgery requirements identified during Stage I. Admission with operating vet for pre-operative patient assessment and discussion of planned procedure and estimate with owner. Repeat pre-anaesthetic bloods (if indicated based on previous blood results). IV fluids (if required as per Stage I). Tooth extraction(s) or crown amputation(s) (e.g. Feline Resorptive Lesions Type 2). Suturing of gums after tooth extractions. Repeat x-rays post extractions (if indicated). Home with analgesia (with or without antibiotics). Discounts as for Stage I (i.e. 10% off PHC). Post-op check with nurse after 3 days. Final check with vet after 10 days for discussion of ongoing dental prophylaxis and management plan, as well as dental check frequency with oral health nurse. Why is the procedure split in to two stages? The main reason for this is to prevent your pet from being under anaesthesia for an excessively long period of time. 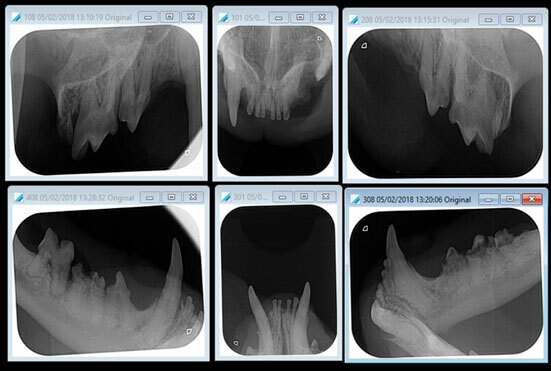 The charting, scale and polish, and full mouth x-rays (i.e. Stage I) can take up to one hour alone. Extended anaesthetics can lead to low blood pressure issues (hypotension), as well as the development of a reduced body temperature (hypothermia), both of which can be harmful to your pet’s anaesthetic safety and recovery. It also allows for proper planning of the required oral surgery, rather than unexpected diseases being identified during dental radiography, and these having to be addressed immediately. Performing Stage II on a separate day allows the oral surgery to be performed in a cleaner environment, rather than immediately after the descaling process. Two planned, shorter procedures increase the likelihood of smoother and timelier recoveries at both stages. No, we have structured our dentistry fees so that the price paid is the same as it would have been if charged under one sitting. However, the staging process allows us to properly estimate for what is involved. Historically we would have called you during your pet’s anaesthetic to seek verbal permission for extractions, as well as the additional costs that this would incur. You would then have a much larger bill to pay at the time of discharge than that which you had originally been estimated, which we don’t think is fair. The staging process seeks to avoid this, so that the price estimated is as close as possible to the price that you are charged. Are multiple anaesthetics safe for my pet? If your pet is able to receive one anaesthetic, then there is no reason why they shouldn’t be able to cope with a second (or third). The premedication and anaesthetic combinations that we use are selected specifically for your pet, based on their individual health needs. Furthermore, every pet’s anaesthetic is closely monitored by trained professionals, as well as electronic multiparameter anaesthetic monitoring equipment. In all cases, consideration has to be given to the risks and benefits. However, in the case of dental disease, then the benefits often outweigh the risks. Two shorter planned anaesthetics are certainly much safer than one excessively long one, especially when dealing with a chronic problem which is elective as opposed to being an emergency. Why does my pet need to have a second stage procedure anyway? 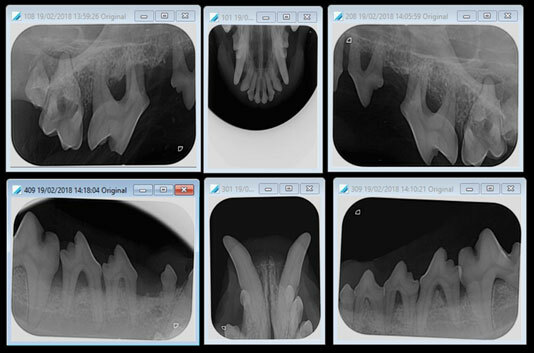 A second procedure is required because the dental x-rays have revealed diseased teeth/roots/jaw bone. Without appropriate action, the disease processes will continue, and ongoing dental disease and infection will persists. More importantly, dental disease is painful, and without appropriate action your pet will continue to live with a chronically painful mouth. ...them to have an anaesthetic? Although this practice is offered by some groomers, it presents a major animal welfare concern. Veterinary organizations worldwide agree that dentistry without anaesthesia is not medically beneficial. The person conducting the dental procedure cannot possibly evaluate the pathology, nor conduct any meaningful sub gingival treatment without proper anaesthesia. This may lead to a cosmetically improved oral cavity with persistent infection, inflammation, and pain. Therefore, not only is the procedure ineffective, it often results in masking the pathology present, which delays appropriate care. This directly opposes the welfare benefits, and improvements to quality of life, that are at the centre of these guidelines. Additionally, the stress or discomfort incurred during this time consuming cosmetic procedure is wholly avoidable and indefensible from a medical and ethical standpoint. As such, the World Small Animal Veterinary Association strongly objects to the practice of veterinary dentistry without appropriate anaesthesia is inadequate, and provides a substandard level of care which may be misleading to the pet owner. What happens after Stage II? Once the Stage II procedure is complete and all the oral disease is under control, then the process doesn’t stop there. Ongoing home dental care and routine check-ups are essential to maintain your pet’s mouth, gums, and remaining teeth in as healthy a state as possible. Twice daily tooth brushing with pet toothpaste is the Gold Standard, as plaque begins to accumulate within 24 hours of being removed. Regular nurse appointments are recommended after a dental procedure, to ensure that success is being achieved, and to help and offer advice if problems are starting to return. The first appointment should initially be 3-4 weeks after completion of the final Stage II post op check. Thereafter, we will recommend seeing your pet every 3-6 months so that future oral health is monitored and maintained. ...dental being recommended by the vet/nurse? Dental disease can lead to unrelenting pain and unchecked infection, create immunological and physiological stress, cause serious local and systemic diseases, and prevent natural behavioural expression. Behavioural changes due to oral pain can be vague and non-specific, and rarely result in loss of appetite. ...and another dental is being recommended. Why didn’t the procedure work last year? A dental procedure can address the diseases present at that moment in time, but it is not a protective measure against future disease. Active post-operative dental homecare is the only way that this can be achieved. Without appropriate actions then your pet will unfortunately continue to be in pain, and be at risk of systemic infections and compromised health. Can I claim for these costs through my pet’s insurance provider? This depends on the terms and conditions of your pet’s insurance policy, but it is certainly worth checking. Some insurance providers offer a pre-authorisation service, where they will confirm whether or not costs will be covered before treatment is undertaken. So, this can be performed if you are concerned about the costs and wish to know beforehand if they will be covered. In cases where costs will not be covered by your pet’s insurance provider, an alternative finance option is Carefree Credit. Please ask us if you have any additional questions about costs and payment.